In the sport of college basketball, building the resume is arguably the most crucial objective of the season. Out of the 68 teams selected for the NCAA Tournament every year, only 32 of those spots come from the automatic bid that each conference winner gets, which leaves 36 at-large bids. Those at-large bids are what bring the drama on Selection Sunday and in many cases, the deciding factor on what puts one bubble team in over another is the strength of schedule. While Middle Tennessee’s conference schedule occasionally provides some quality opponents, Conference-USA is typically considered a one-bid league. Ever since MT joined the conference back in 2013, the automatic qualifier has been the lone representative of the conference in the Big Dance. This notion of the C-USA being a one-bid league causes a need for the Blue Raiders to beef up the non-conference schedule and this season will present the team with just that. The Blue Raiders 2017 non-conference schedule guarantees four games against teams that qualified for the NCAA Tournament last season (Florida Gulf Coast twice, Vanderbilt and Princeton), along with the potential for two more games against tournament teams (Miami and USC) depending on how they fare in the Diamond Head Classic tournament this December in Hawaii. The rest of the teams in the conference play no more than three teams from last years’ tournament in their non-conference slate. Head coach Kermit Davis believes the tough scheduling would serve a dual purpose: resume building and conference play preparation. Establishing a tough strength of schedule and getting quality wins boosts the Rating Percentage Index ranking, which is the most important metric of resume building. The RPI is a metric the rates teams by their strength of schedule, as well as the quality of wins on their schedule. Last season, the Blue Raiders finished the regular season ranked 34th in the entire country in RPI. A ranking of that caliber is almost enough to get a team into the madness of the NCAA Tournament even without the help of an automatic bid that comes from a conference title. Senior guard Giddy Potts is all too familiar with building the RPI ranking and the spotlight it puts on him and his team. “The road games are what help us with the RPI,” Potts said, adding emphasis that the quality road wins are what have put certain teams into the tournament during his time at MT. The most obvious benefit of loading up your non-conference schedule with tough opponents is the overall improvement of your team and the development of some of the younger players. Assistant coach Greg Grensing believes this stiff competition will be what molds some of the inexperienced players, and that will keep the starters on their game. The young players that come off the bench will be a serious point of player development during this tough non-conference schedule. 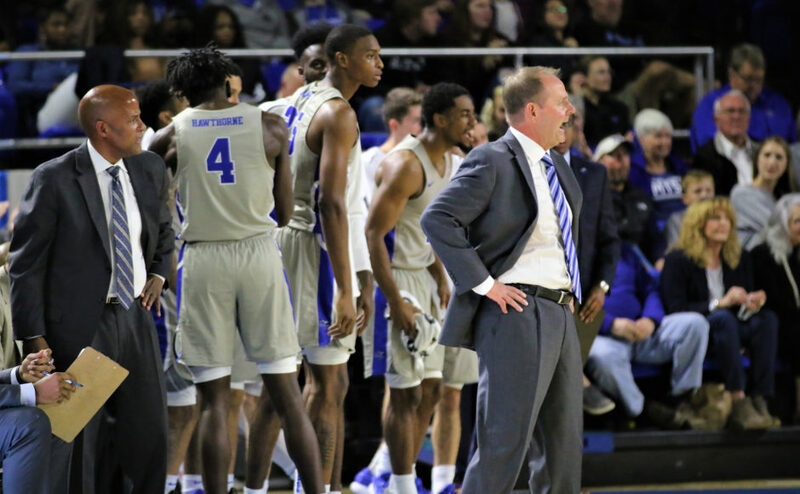 Tough road tests like MT’s five-point win at Murray State provide bench players the opportunities to step up and prove their worth in tough environments. While Gamble (seven points and six rebounds) and Simmons (eight points and five rebounds) stepped up in a big way on Monday, Grensing still looks for other role players to step up during non-conference action. “We still want to bring along (James Hawthorne) and (Therren Shelton-Szmidt) but primarily, those are the people we have to watch and see who we can trust,” Grensing said. Potts also believes the non-conference schedule can be the ultimate measuring stick for the team before the grind of conference play. Lastly, a crucial benefit of the Blue Raiders schedule is the inclusion of three Southeastern Conference schools and a couple of nationally televised games on CBS Sports Network. The games against Vanderbilt and Auburn will also be televised nationally on the SEC Network.